No offense, but Dormont is usually a place we drive through on the way to somewhere else. But on one of those trips, we happened to glance out the car window and into a place that seemed to invite us to stop and stay a while: a warmly lit, friendly-looking restaurant named Mexi-Casa. Through the storefront, we spied a Tex-Mex menu written up on hand-lettered boards. It looked good and cheap. That time, the light turned green and we moved on, but as we motored down West Liberty Avenue to our final destination, we vowed to return. Last week we finally did, and the warm welcome we received as we walked in 15 minutes before closing let us know that our windshield impression had been right on. 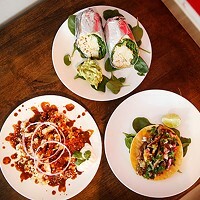 Located in an old storefront with a high, ornate tin ceiling and cracked plaster worthy of an ancient pueblo, Mexi-Casa is set up for taking out, eating in, or hanging around, with a counter facing the customer service area so that you can chat with the forthcoming owners and employees while you eat. You might think that the brother, sister and husband team who opened Mexi-Casa last year have Texas roots, but no, they just love the food. And everything about the restaurant, from the atmosphere to the menu to the service, shows it. 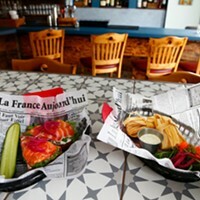 As it was late, we arrived weak-kneed with hunger, and ordered a platter of nachos before we could even open our menus. Turned out we could have just about stopped right there. A pizza plate loaded with crisp red, white and blue corn tortilla chips arrived covered in gooey floes of cheddar and jack, with heaping portions of cool sour cream and a well of bold, chunky salsa in the middle. A constellation of jalapeño rings finished off the big, messy, delicious feast. Unlike some nachos, where there never seems to be enough cheese or salsa to complement every bite, Mexi-Casa's were good -- make that very good -- to the last chip. Speaking of which, the menu promised that the tortilla soup would be "the best chicken soup you will ever taste," so we put that to the test. The almost-creamy broth was thick with shredded chicken and chunky with bits of chopped tomato, onion, and pepper. Richly infused with the flavor of jalapeno peppers, the soup was spicy enough that the experience of each spoonful lingered -- pleasantly, not punishingly -- in our mouths for several minutes after eating it. It was served with a slice of jalapeño cornbread which was sweet and soft, almost moist, with a subtle hot-pepper bite. The steak soft taco was what it was, no more, no less: grilled sirloin tips wrapped in a flour tortilla with lettuce, tomato and cheese. The spicy chicken burrito stood out more, generously stuffed as it was with tomato rice, black beans (refried are, of course, also available), cheese and spicy chicken filling. Shreds, not chunks, of chicken were stewed with tomatoes and spices until they had enough flavor to carry the whole wrap. The burrito was meal-sized without being Texas-sized, and our only complaint was the plain, overly-moist flour tortilla -- a few seconds on Mexi-Casa's big, smoky grill would have really livened it up. Indeed, we had few complaints at all about Mexi-Casa, and are eager to go back to Dormont's first-day attraction.